Yopo (Anadenanthera peregrina) seeds to create a Cohoba snuff or grow a Yopo tree at home. The seeds of the Yopo tree contain DMT and bufotenin. If you prepare the snuff well, these substances can induce hallucinations. Contains 5 grams of Yopo seeds. In hermetically sealed packaging. 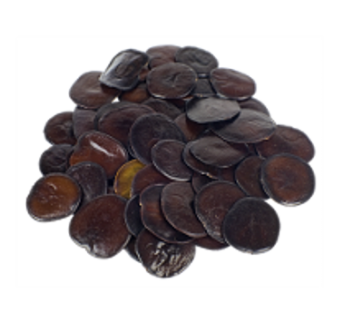 The seeds of the Yopo tree contain the alkaloids N,N-DMT (‘regular’ DMT), 5-MeO-DMT and large amounts of bufotenin in particular. These hallucinogens cause a short, but very intense trip. People who have tried Yopo report multidimensional visions about death and rebirth, animal transformations and the dissolution of the ego. The effects of Yopo sometimes draw comparisons to DMT, LSD and of course also to its little brother Cebil (Anadenanthera Colubrina). In comparison to DMT and LSD, Yopo is slightly less intense and the trip also isn’t as long. 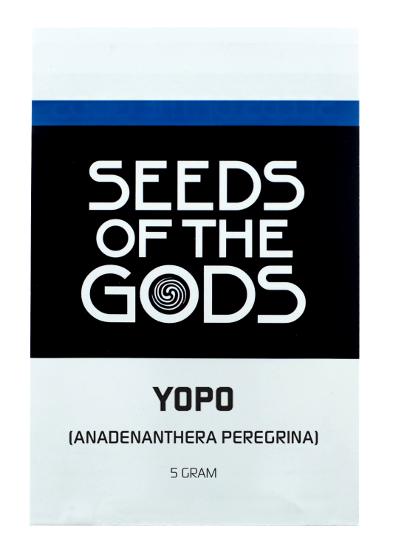 The most common and most popular way to use Yopo seeds is to sniff it. You can create your own snuff using Yopo seeds and lime (calcium hydroxide). Baking soda is sometimes used as well. To create the snuff, you’ll first have to toast the seeds on a low fire, until the shells pop open. You can then pry open the shell with a small knife or your fingernails and take the kernels out of the seeds. Grind up the kernels with a pestle and mortar and add lime. The recommended ratio of Yopo to lime is usually somewhere between 2:1 (Yopo to lime) or 3:1 (Yopo to lime). Carefully mix the two. Then add a few drops of water and knead into a thick doughy, pasty substance. Leave this paste to dry for a few hours up to a few days in the open air (you won’t need to heat it), until you can no longer smell the slight ammonia odor. As soon as it’s dried completely, use a pestle and mortar to grind it into a fine powder once more. What you’re left with is your very own, artisanally crafted Yopo snuff! Many people report that sniffing Yopo is quite painful. Traditionally, people use sniffing tubes to blow the powder in each other’s noses. In this way, you’re able to ingest more powder than when sniffing a line of snuff yourself. You’re better off spitting out the fluids that reach your throat from your nose. This will prevent the snuff from reaching your stomach, potentially causing nausea and vomiting. The intensity of the trip depends on the preparation of the snuff and the Yopo to chalk ratio. For a strong trip, you will need to use 3 to 5 seeds. First you will feel physical effects: a heavy feeling, tingling sensations all over your body, and possibly headaches. Then the hallucinations start. The trip usually lasts for 15 to 30 minutes. The aftereffects last for up to an hour. The Yopo tree is originally found in the tropical regions of South America, such as parts of Brazil, Colombia and Peru. The Yopo tree does not grow in rainforests but prefers drier areas like savannas and open plains. Yopo trees can reach up to 18 meters in height and are characterized by their grey-black thorny bark and green, pinnate leaves. It’s not easy to cultivate a Yopo tree outside of the tropics, but you can attempt it if you keep it as a houseplant on a very bright spot. To germinate the seeds, first soak them in sterile water for 24 hours. Afterwards, sow the seeds in a mixture of perlite and sand, approximately 1 cm deep in the soil. Make sure the soil is moist, but not wet. Place the pot(s) on a bright spot (without direct sunlight) at a temperature of at least 22ºC. Water regularly and keep the space ventilated to prevent mold from developing. To cultivate the saplings into small trees, you will have to replace them to a larger, deeper pot with excellent drainage. The Yopo tree (Anadenanthera Peregrina) is a member of the legume family, just like its little brother Cebil (Anadenanthera Colubrina). The indigenous peoples of South America use snuffs fabricated with the seeds of the Yopo tree during shamanistic rituals, similar to Ayahuasca and Cebil. In such rituals, people us sniffing pipes to blow the powder in each other's noses. Hunters sniff Yopo to localize prey. The hallucinations induced by Yopo are also used as a means for fortunetelling. Yopo is a rather experimental psychedelic drugs and difficult to dose. People with little to no experience with shamanistic psychoactive substances are recommended to begin with a lower dose. Many users report nausea, dizziness, stomach aches, headaches and vomiting during a Yopo trip. Sniffing Yopo is considered to be a very painful experience for most!